Ofsted occupies an important position in our education landscape, but inspecting over 20,000 state schools is still a considerable undertaking. 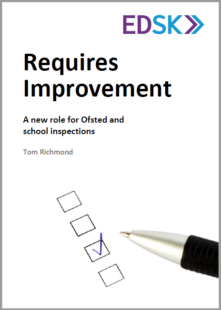 This inaugural report from EDSK therefore seeks to answer four questions: first, can parents trust the grades given to schools by Ofsted; second, is Ofsted measuring the right things; third, what impact does Ofsted have on teachers and school leaders; and fourth, do Ofsted inspections lead to better schools? Join our mailing list to receive future updates from EDSK, including copies of all our publications as well as information about our events and seminars. "The coolest thing that I’ve done in my life thus far"
Lebron James (@KingJames), one of the greatest basketball players ever, opened a school in New York as an experiment. It has already posted extraordinary test results. 50 people have already been charged in connection with America's university admissions bribery and cheating ring. To quell the 'Yellow Vest' protests and boost his popularity, Emmanuel Macron has decided to take on the French equivalent of Oxbridge: the National School of Administration, an elite postgraduate institution. © EDSK 2019. All rights reserved. EDSK is a non-profit organisation and a registered company (company number: 11795717).